Professional landscaping adds value to properties, creates beautiful outdoor living spaces, provides proper drainage and erosion control and creates a place you love to be. Fountains, pools, waterfalls, streams, fish ponds and “pond-less” waterfalls transform your landscape into something very special. The gentle sound of moving water is relaxing and the beauty of water features is aesthetically pleasing in outdoor spaces. GTN has an array of designs and features for any type of outdoor space. Pond-less water features are excellent choices for public areas where low maintenance and safety are priorities. Browse our collection of water features for inspiration and ideas. Adding hardscaping to your landscaping is a terrific way to add outdoor living enjoyment and value to your home. Research indicates that outdoor "rooms" are a great investment; they return 100 % of their value and may deliver as much as 200% of their original cost at resale. GTN has two ICPI (Certified Concrete Paver Installers) for professional installation of pavers. 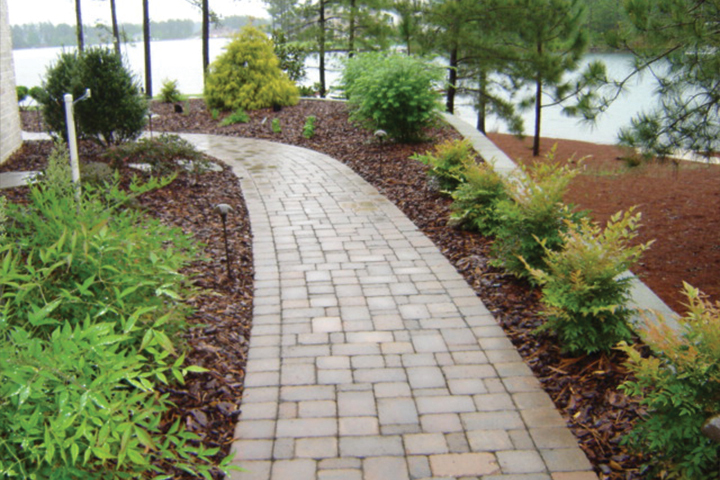 We use a range of high-quality products allowing homeowners to have many choices for unique applications that complement homes and landscapes. Our creative designers create patios and walkways that flow from space to space. They have the expertise to assist you in choosing hardscaping products and applications that beautify your outdoor living spaces. View examples of our creative work in our hardscaping gallery. If you are building a new home, the location of the house on the lot, driveways and walkways are important details that need to be addressed early in the planning process. GTN is an excellent resource; they have expertise with driveway and parking issues, and installation of walkways. These hardscape elements are an important part of your landscape. Planning before construction begins can prevent expensive mistakes. Properly designed and installed low voltage lighting can enhance your grounds or gardens at night and provide security. Landscape lighting highlights your landscape and architectural features, allowing you to enjoy your surroundings after the sun sets. Careful placement of accent and path lighting provides safety for pathways, driveways and entranceways. Strategically placed lights can also feature specific plants and create a welcoming outdoor atmosphere after dark. Poor drainage is one of the biggest challenges when landscaping. Professional grading plays an essential role in correcting drainage and providing the optimum environment for beautiful and healthy landscaping. 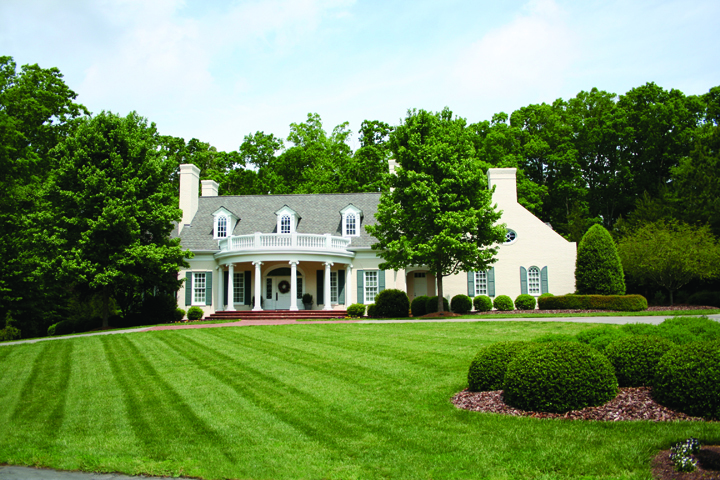 A healthy lawn can improve property values and help prevent erosion. GTN provides the expertise and products to transform soil into a healthy, green landscape. In situations where quick results are desired, sodding establishes an instant lawn. Seeding is a less expensive option than sodding. However takes approximately 3 years to establish healthy, mature turf from seed. Well-timed seeding of fescue can be an effective and less expensive way to grow turf for your landscape. Irrigation is also very helpful in establishing and keeping healthy turf in North Carolina. Tilling and amending soil (as needed) are the most important parts of the landscape technique, and essential when developing landscape beds for ornamental plants and planting trees. Clay soil needs enough aeration. In sandy soil, providing enough water is an issue. Poorly drained soils, soil texture and its pH (acidity or alkalinity) are factors that need to be considered. Bed preparation is key when providing plants and trees with the resources they need to thrive. Water and oxygen are required for plant growth and bed preparation provides the needed balance between the two. Proper irrigation design and installation supplies the watering coverage landscaping needs while conserving water. State law requires that irrigation systems must be installed by an irrigation contractor licensed by the North Carolina Irrigation Contractors Licensing Board or by a plumber. GTN has two NC registered irrigation contractors for irrigation installation and maintenance. Our trained staff also has the expertise to set up and adjust irrigation systems to balance adequate watering with good water stewardship. Landscape mulching uses a variety of materials to provide weed control in landscape beds, increase moisture retention, maintain soil temperatures and for aesthetics. GTN offers an array of mulch materials with different appearances and life-spans, for your requirements. Pine bark nuggets are often used; although they’re more expensive than other materials they can last for two to three years before re-mulching is needed. 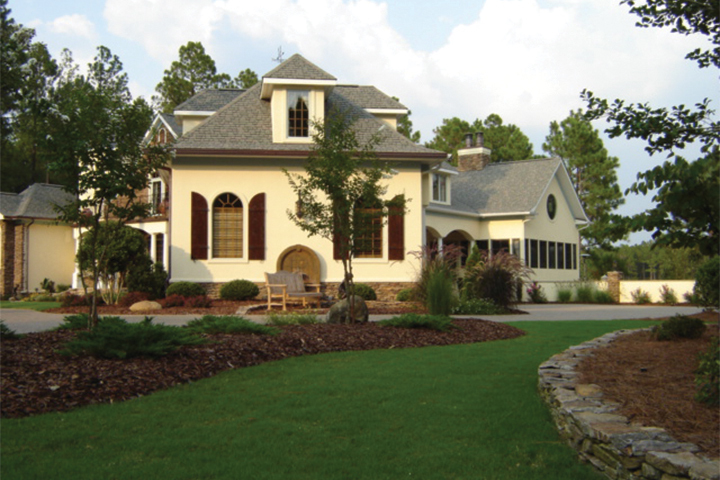 Pine straw is a less expensive option, but it needs to re-applied every year and sometimes twice a year, to maintain its color. Decorative rock may be used in some areas where an accent is desired. Pergolas and arbors are beautiful accents, providing places to enjoy your outdoor garden spaces. A fire pit with nearby seating is a welcoming gathering space and it warms outdoor activities on cool nights. Pergolas enhance patios and create some shade, adding beauty and structure to your landscape garden. Arbors and pergolas are a beautiful entryway to the front door or backyard garden, or an accent in the garden area adjacent to a patio. All of these elements anchor gardens and landscaping, giving you a nice place for your morning coffee, outdoor dining and entertaining. Professional landscape design and installation transform commercial and residential properties into beautiful and functional outdoor living spaces. Greenthumb Nursery creates unique and beautiful designs that reflect our clients’ style, while adding value to their property.